Fontina is an Italian cow's milk cheese. Fontina cheese has been made in the Aosta Valley, in the Alps since the 12th century. It has a milk fat content of around 45%. Italian Fontina can be identified by a Consorzio (Consortium) stamp of the Matterhorn including the script "FONTINA". As with many original varieties, the name "Fontina" has been imposed upon by such derivatives as "Fontinella", "Fontal", and "Fontella". Although the version from Aosta is the original and the most famous, Fontina production occurs in other parts of Italy, as well as Denmark, Sweden, Quebec, France and the United States. Young Fontina has a softer texture (and can be suitable for fondue). Fonduta alla valdostana (Italian) or Fondue à la valdôtaine is a traditional dish of Fontina whipped with milk, eggs and truffles. Mature Fontina is a hard cheese. Fontina has a mild, somewhat nutty flavor, while rich, herbaceous and fruity. It melts well. Fontina produced in the Aosta Valley must be made from unpasteurised milk from a single milking, with two batches being made per day. It is noted for its earthy, mushroomy, and woody taste, and pairs exceedingly well with roast meats and truffles. 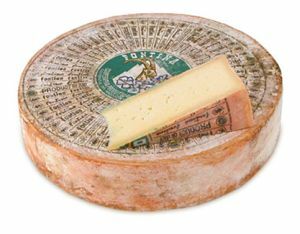 Fontina has PDO status under European law.